Ageing: This look is created by making the furniture seem aged and distressed. A piece of ‘aged’ furniture usually has faded colour (whites usually turn to a cream colour), the paint is peeled at some places and has a general ‘worn’ look. Sponging: Both furniture and walls can be sponged. The wall or piece of furniture need to be coated a base coat with the intended colour. After it has dried completely, a sponge is used to dab the paint onto the object or wall. Ragging: This process is similar to the sponging technique, except instead of using a sponge, you use and old cloth or rag. 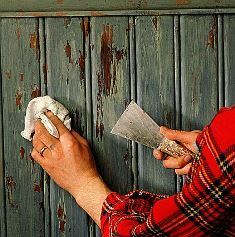 The rag should not be saturated with paint, keep it as dry as possible when dabbing the paint onto the surface. You could use any type of rag and be creative, try out different types of materials, like normal cotton rags to hessian. 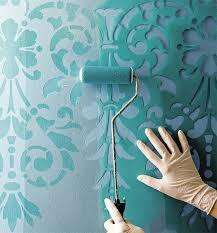 Colour washing: Colour washing your walls will create a somewhat worn plaster-like look. To create this look you will need to dilute your paint and unless you are painting over a dark colour, you will use only one coat. For a beautiful finish, add a glaze over the paint. Stippling & Stenciling: Stippling creates a soft-textured sense of depth. While stenciling provides detail to a room, be it on your walls or chosen furniture. With stenciling, you can reproduce the same design time and again. Graining: This painting technique is used to create the look of wood grain on a non-wood surface. This technique is often used on less expensive woods too, to create the impression of more expensive wood. 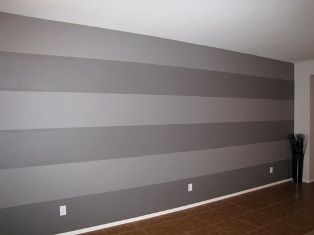 Taping: If you like a striped pattern, use tape to create a simple pattern on either your walls or furniture. If you are a bit hesitant to use wallpaper, this is a great idea instead. Simply stick the tape in the pattern you want to use and get painting! When the paint has dried, simply pull off the tape. Shaping/Blocking: This painting technique is applying a shape of your choice to your wall or furniture. A cut-out shape is dipped in the paint of your choice and pressed against the surface. Textured paint: Not only does textured paint cover up small flaws on a surface, but it creates a luxurious ambiance. Textured paints are usually applied with a long nap roller or a sponge. The downside of using textured paint is that it is a little harder to remove or repaint. Contact PROPAINT for more advice and great quotes on painting techniques today!